An 8 x 10 fine art, archival print, printed from a digital file on traditional darkroom materials in a chemical darkroom. Price includes tax & shipping/handling. Enter title of print in the notes to seller during checkout. An 11 x 14 fine art, archival print, printed from a digital file on traditional darkroom materials in a chemical darkroom. Price includes tax & shipping/handling. Enter title of print in the notes to seller during checkout. A 13 x 19" fine art, archival print, printed from a digital file on traditional darkroom materials in a chemical darkroom. Price includes tax & shipping/handling. 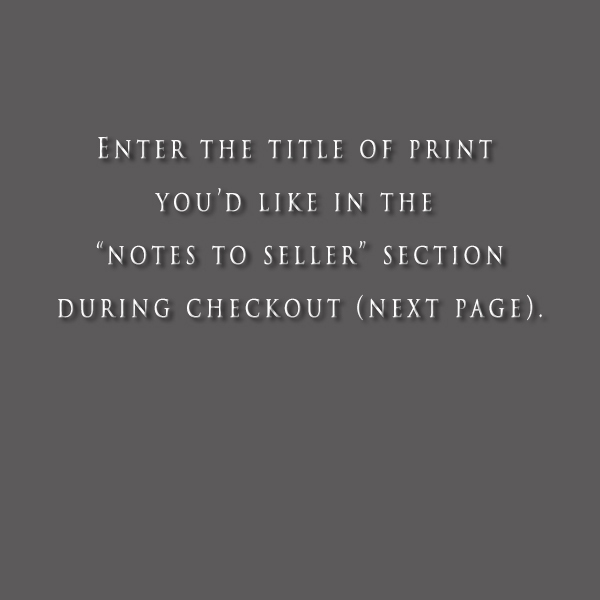 Enter title of print in the notes to seller during checkout. An 16 x 20 fine art, archival print, printed from a digital file on traditional darkroom materials in a chemical darkroom. Price includes tax & shipping/handling. Enter title of print in the notes to seller during checkout. A 20 x 24" fine art, archival print, printed from a digital file on traditional darkroom materials in a chemical darkroom. Price includes tax & shipping/handling. 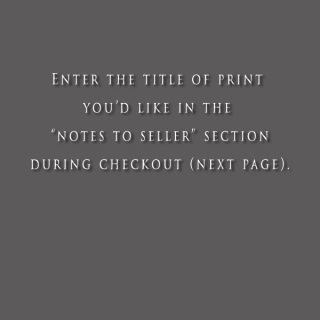 Enter title of print in the notes to seller during checkout.